Due to various reasons, you may forget your WiFi password used on your iOS device. If you forget WiFi password on iPhone, you will struggle a lot to connect to internet. Well, if you belong to the large crowd that has forgotten WiFi password, this article comprises of precious information for you. Questions like “I forgot WiFi password iPhone. Can you please help me recover it?” are very common these days. From this point onwards, we explain the most convenient ways to overcome such issue and use internet on your iPhone. Thanks to the iCloud synchronization, recovering the saved passwords on your devices is a walk in the park. You can use the feature Keychain to retrieve the saved passwords on your device. Please note that this method needs a Mac computer. 1. Go to the “Settings” app on the device and tap on “iCloud”. 2. Then, go to Keychain and turn on the iCloud keychain. 3. Go to the Settings app once again and turn on the option “Personal Hotspot”. 4. Connect your Mac to the personal hotspot you created on your iPhone. 5. Open Spotlight search on your Mac and type “Keychain Access” and hit enter. 6. Search and open the respective WiFi network. Then click on the option “Show Password”. Let’s try to reveal your forgotten WiFi password through the router settings. Please note that this method may or may not work and it requires more effort compared to the previous one. However, we believe that it is worth trying every chance you have in order to recover the forgotten WiFi password. 1. Go to Settings and select WiFi. 2. Click on the “i" icon next to WiFi network. 3. You should write down the IP address available in the router section. 4. Go to Safari browser and enter the IP address you wrote down and hit enter. 5. Enter the username and password of the router (you must know the its username and password). 6. When you are in the router settings page, go to the section where WiFi password is available. 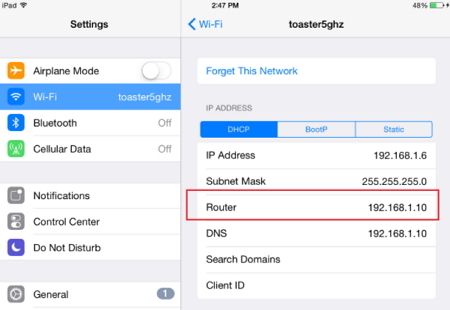 If you have a jailbroken device, here are the steps you can take to reveal the forgot WiFi password. 1. Perform a search on Cydia with the term “WiFi Password” and download the app. 2. Install it and click on “Return to Cydia” and press Home Button. 3. Click on WiFi Password icon and open it. 1. Search for Speedssid in Cydia, download and install it. 2. Now, perform a scan for the available networks and check if you can view the password. Practically, you don’t find many tools that can recover WiFi passwords through iOS devices. However, the good news is that iMyFone is currently working on such a tool. If everything goes well, pretty soon we will be able to enjoy the assistance of a good WiFi password finder from iMyFone. Step 1. Download and install this software on your computer. Click Start button and connect your device to computer successfully. Step 2. Once the iPhone is detected, just scan your device. You also need to enter the password in order to allow the program to access the data on your device if you have set password for it. Step 3. After scanning, your WiFi information will be listed on the screen. Now all you need to do is to press Export button to save them to computer. If you forgot WiFi password on iPhone, you will know what to do now. You can try all the options mentioned above and check if you can recover the forgotten password. But please note that jailbroken devices are exposed to security vulnerabilities. Just stay patient and work smartly without panicking. We are ready to answer any other queries you may have, so leave a comment and let us know what you need.